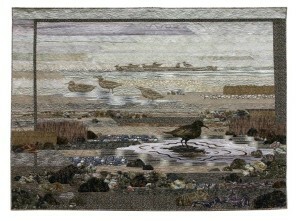 I have been invited to show a few of my quilts at the Columbia River Piecemakers Quilt Show this Saturday. Click on the link to get the details – time, place, admission fees etc. They are giving me four quilt standards for my quilts and now I have to make the incredibly hard decision of which quilts to choose out of the literally hundreds of quilts large and small I have in my collection. I have decided to hang two large quilts and devote the other two stands to panels featuring a collection of smaller quilts, one will be devoted to my landscapes while the other to my ethnic inspired quilts. Still, even with that narrowed down parameter, I have to choose a crosscut of my work that will hang well together and yet provide some visual variety. This will not be easy and I know what I will be doing today and tomorrow. On a related note, a friend of mine – Irena Swanson – is having a one woman show of her work at Reed College in the Vollum College Center Lounge. The lounge is used for meetings and is not readily accessible to the public at predictable hours but she is having an artist’s reception this afternoon (I’m sorry, I should have posted this with more warning) from 4-6 pm. She will also have an open house demo of her unique piecing technique a week from today on September 14 from 2:30 – 6:30 pm. If not the reception tonight, perhaps you can attend the demonstration, it is well worth seeing.